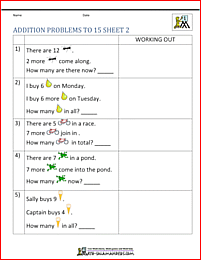 Here you will find a wide range of free printable addition Worksheets, which will help your child practice solving a range of addition problems using numbers with a sum of up to 20. 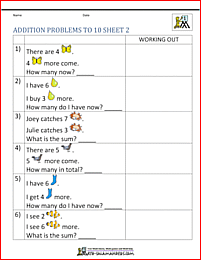 Each sheet consists of adding two or three numbers with a total of up to 10, 15 or 20.
add with numbers up to 10, 15 or 20. 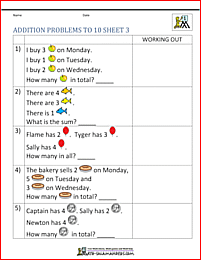 This sheets has word problems with 3 addends. 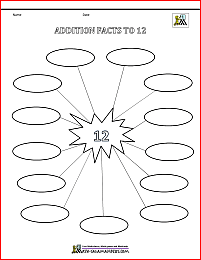 Take a look at our Addition sentences to 12. 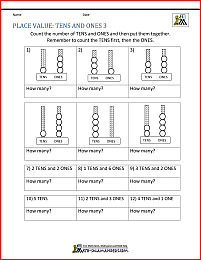 On this page, your child will learn to work out basic addition sums up to 12 by counting objects. 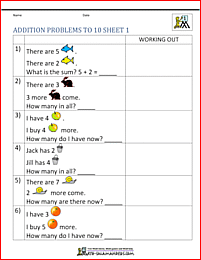 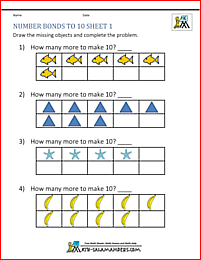 Take a look at our 1st Grade Addition facts Worksheets page with numbers up to 12+12. 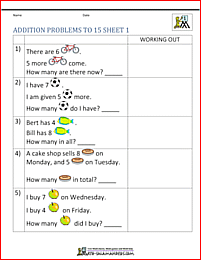 On this page, your child will learn to work out basic addition sums to 12+12.